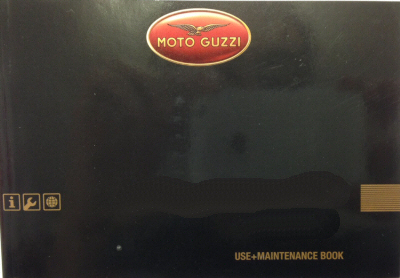 OEM Moto Guzzi Owner's Manual .PDF download. This is not a hard copy of the manual. You must download the manual by logging into your AF1 Racing account, or wait for delivery of the CD-Rom, if that option was chosen. Vehicle Configuration, Use, Maintenance, Technical Data, and the scheduled maintenance intervals chart. Purchase this product to download a .pdf version of the owner's manual. The manual will be available to download by logging into your AF1 Racing account. Once the order is shown as "paid" or "shipped" you may download the manual.